When I was told that Concord and 9th designed a stamp with the MISTI in mind, my heart skipped a beat. I had already started collecting their stamps and was excited to hear that they were sending me two stamps from their new release. The Flourish stamp set is so easy to use. I stamped it with white pigment ink onto black cardstock and then overstamped with other colors. Using the Mini MISTI made it easy to overstamp in the various pigment inks. I loved the way it turned out. It looks like a chalkboard drawing. I think it would be nice on kraft cardstock as well. Adding the layer of clear embossing powder intensified the colors. Greg and Angie also sent me the You Crazy Cat stamp set. Instead of using the stamp as intended, I used the octagon template to make a sun with the ear stamp. You can make this into a flower also by stamping a center of some kind. Both cards used sentiments from the Love You, Mean It stamp set. We are also having a giveaway for a Mini MISTI. All you have to do is leave a comment on each blog for a chance to win. We will announce the winner on the My Sweet Petunia Facebook page, so be sure to like the page. I filmed videos for each. I hope you enjoy. What a fabulous take on this stamp set! I would never have thought of using black card stock, stroke of genius! Love the card and the chalkboard look with the embossing so pretty. These are both so great!!! So many sets match perfectly with the MISTI, but so nice to see one designed that way! I love your card, and am anxious to get my hands on that cute set! AWESOME - the sun idea was genius and they are both great! Love the chalkboard look of the black card! Simply stunning (yet very do-able)! Lydia stole the words right out of my mouth! What fun! Woot! It DOES look like a chalkboard drawing! So cute and so easy with the MISTI! Two fabulous cards! Thank you so much for the videos...I really enjoyed them! Both of your cards are absolutely stunning! I especially love the chalkboard effect of the first one! The stamped images just pop against the black background! The finishing touch of sparkle looks amazing on both of your cards! Thanks for sharing the tutorials! Very pretty and well done, love it ! Thanks for sharing ! Love the sun card. What is the quickest way to figure out the placement of the sunray? Both cards are great! Really love the black and the fun smile in the 2nd one! Love the chalkboard drawing effect! And the sun is so creatively adorable! Thanks for the inspiration! Ackk!!! The flowers on black is just stunning! I loveve your cute sun! Clever girl! love both cards, great job! I love the look of the chalkboard effect on black card stock. Such a beautiful flower stamp set. I liked seeing the use of the Mini MISTI with this technique. Your Flourish card has that WOW factor in colors and design! Love it! 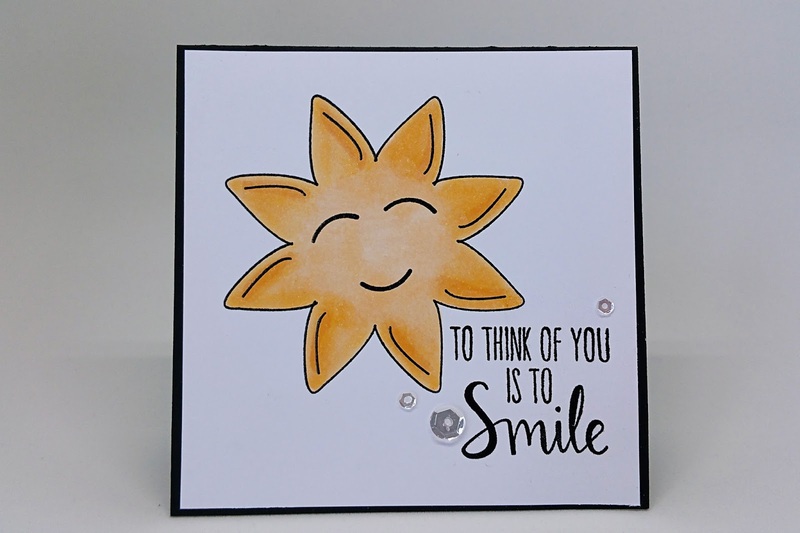 The sun card will brighten someone's day for sure! Using the Mini Misti makes stamping so mych easier. Just am in love with your first card............it is exquisite! I also like how you used the stamp on the second card......you are one creative lady! I still do not have a MISTI, but a mini would be ok too.......hope I win. The chalkboard effect is beautiful with this set, and the video instruction was very helpful. I'm looking forward to trying this. Two very beautiful cards! I love the techniques used - will have to give those a try myself! Love the cards -- and that sun is so clever! the first card is just lovely and the second one is so clever!! That "chalk" on black card is beautiful. TFS! This is a blog hop full of inspiration! Both cards are great but the first one is gorgeous!! Oh wow, the stamping on the black cardstock is so very, very striking. And I love how you used the ear; you can't even tell! Love those blooms ... how pretty. Love your cards - never thought of stamping in white first, then overstamping, but this sounds intriguing - Misti makes it easy! That flower is gorgeous. The depth of colour is amazing. Thank you so much for providing videos, too. So helpful. Beautiful card and what a genius idea to use the ear to create the sun, super cute! Both cards are fabulous! Love the soft colors on the black cardstock and your smile card, well, makes me "smile"!!! Great cards, love the technique on dark card stock. Awesome cards! Love the effect of the flowers against the dark cardstock! I can see that the MISTI is a fabulous tool for cardmakers! I am anxious to get one! Love these awesome stamps too! LOVE how you stamped the flower stamp set on black cardstock!! Looks so beautiful!! Love the black card! Such a cool texture to the flowers.. I almost thought they were felt at first. These are amazing cards! I love this tool!!!!! Thanks for sharing your awesome cards! I LOVE my MISTI! These stamps are awesome and on the MISTI they would be so fun to play with. Love the black background and it would finally give me something more to do with all the craft inks I have. How exciting to have stamp companies designing stamps intended to be used with the MISTI! CONGRATS! That floral card is amazing...chalkboard but not as messy. Love your color choices for the layering. As for the sun...so very clever and such a happy card. omigosh, love the cards, especially the chalkboard look on black! Thank you so much for the chance to win a mini MISTI, would love one! Very inventive (wink, wink) to use the cat ears to create the sun. Love the chalkboard look of your floral card, too. Thank you for sponsoring the hop, you're most generous. I love the card with the black background...so striking! Love the card on black cardstock. It is stunning! The Misti really does make "incredible" possible. your card is sooo beautiful!! I love what the misti does!! Great cards Iliana! The 1st one is just amazing. I don't have any Concord and 9th stamps yet but I will certainly be looking for them now! I have to tell you this, I thought it was funny...I was the first one in our area to learn about your original MISTI. When I told my card making friends about it and they found out the price they all thought I was crazy. Until they saw mine and how it worked. LOL I know of at least 6 that were purchased soon after! A great product! Cudos to you! I especially love the chalkboard look. The “chalkboard look” card is absolutely adorable! Thank you for sharing the tutorial. I can’t imagine how much wasted paper and what a mess I would have if I didn’t use a MISTI on this one! Thanks for the chance to win one! Amazing cards! Thanks for sharing. What a fabulous technique on the flower card! Love the white under stamping! Cute sun card! Thanks for sharing and for the giveaway! Beautiful card - great stampset! Great cards. The technique of stamping over the white ink is fabulous. The flower is so pretty. I can see how the Misti is invaluable! Great cards! 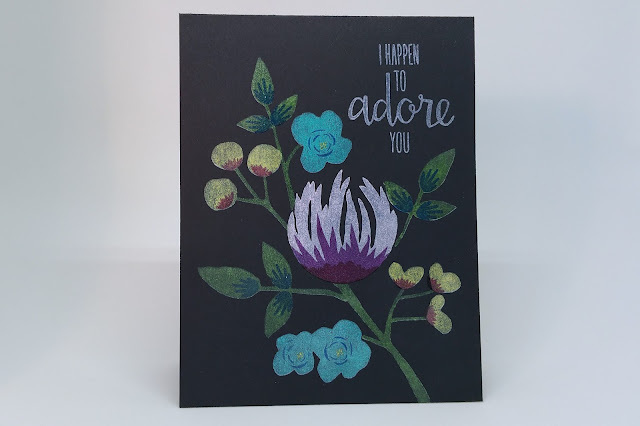 I'm loving the colors on black look and the sentiment on the sun card. Love the chalkboard look of your card! Beautiful cards, Iliana! the effect on the black base is truly stunning! Love this idea on the black cardstock and must say the misti has changed my stamping life forever. Stamps that I put away to never use again are finding their way back into my life. Thank you so much for this wonderful invention! Love the chance to win a mini misti! Too stinkin' cute! My goodness - they are darling! A mini would be great for traveling...just saying. Just wonderful colors on your black based card. Love this card and the MISTI too! Lovely card and that stamp set! That flower is gorgeous and I can see how the misti would make it easier. Perfection is achieved by using the correct tools!! :) I can't wait for a chance to try the MISTI!!! The stamps on the black card and the colors you used makes it striking. I love this look. Also the smiling sun is so-o-o cute. Great card with the colour on black cardstock, it would be interesting to try it on kraft as well! Great cards! Love the chalkboard effect. Thank you for the videos! Your cards are great. I like the Octagon too. I've never overstamped on white before - adding this to my "must try" list! Love the white pigment on black cardstock, then over stamping with color. It reminds me of a still life my stepmother did in college. Great cards! Iliana, I absolutely love this on the black cardstock. Must try soon. The adorable sun is genius. I love how great it turned out. Thanks so much for sharing the videos as well. Wow, I've never stamped on black cardstock before. Your card looks incredible and just love that new stamp set. I don't own a Misti and will never be able to afford to buy one, so really appreciate the chance to win one of my own!!! Wonderful cards! Way to rock the Misti! What a good idea to use the white pigment ink/dark cardstock technique - it's especially effective with these bolder stamps. Concorde & 9th has quickly become my favorite stamp company... I already have a few sets from every release so far! This flower stamped on the black cardstock is beautiful. This stamp set is perfect for the MISTI! How you made the sun from the cat's ear was genious and adorable as well! I love my MISTI so! These cards are amazing! I've never tried the chalkboard look before because I didn't want to have to use the stamp-a-ma-jig to line everything up. Thanks for reminding me of another fabulous use for it! 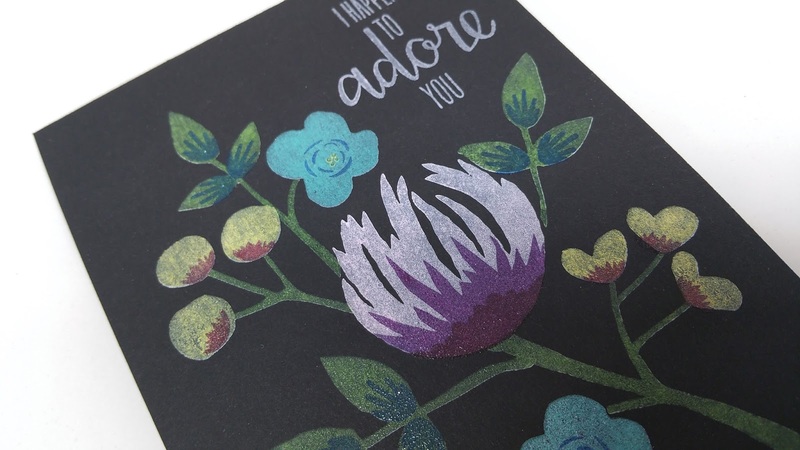 I am loving the floral card with the pigment on dark base, gorgeous! I love how the MISTI has opening up all sorts of new possibilities in stamping! Wow! Beautiful cards! Thank you for this amazing chance to win! Doing the white down first makes the colors so much more vibrant. Lovely. I loved your videos Ilina thank you for doing the Flourish video in almost real time it lets you follow the process easier! Love the Misti! Ooh, that effect with the white embossing and overstamping is fabulous! Would love to win a Misti so I can try it too! I just love how this stamp looks against the dark background and that Misti looks like a super useful tool for any stamper. Thanks for the chance to win, and for the great tips! Great tutorials, love the chalkboard card! The new Concord and 9th stamp sets look great. I love the cards you made. The Misti is such a great tool! I love my MISTI and this technique looks perfect for it! Love this look. It reminds me of when my mom would paint Trichem on black velvet. I love this. I would never have "seen" a sun with that stamp. Thanks for sharing. Absolutely beautiful. I don't own any 2 or 3 part stamps. I will after I win my Misti! just stunning cards...love the black one, amazing!! Beautiful and fun cards!! Love the Misti!!! Your "Sun-card" is beautiful ! What a great idea to make a sun with the ears ! Awesome cards. Love the Sun idea. Thank you for bringing MISTI in our lives. I guess I NEED mini MISTI as I don't have much space! Beautiful project, I love the overall effect :) Good luck everyone. Love the card stamped in white and then the colors. Just got this set in the mail today. Now I need a mini MISTI. Hope to win.!!!! Simple, creative and colorful! Winning the Misti would make my birthday week! I love the baby card. I would never have thought of that. So cute. Oh my gosh, the black chalkboard like card is awesome. What a super technique. I want to get the stamp set and theMisti to do such art!!! Love the chalkboard look. Thank you for sharing.